Packed with features, the X-Light RS-7 race suit provides supreme levels of cooling and comfort. This new suit is constructed from a 2 layer sandwich of breathable Nomex®/Carmyth fabric. Weighing in at under 300grm/sq. 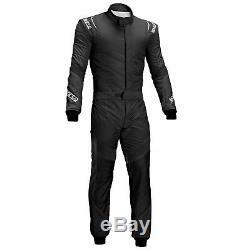 M (size 52 only 1020gr), the racing suit is also conditioned with Sparco's X-Cool treatment to help reduce overall body temperature especially in hot conditions. Stretch panels on the legs in EAGLE fabric, are more wear resistant to wear and more breathable. The new fabric is also used on the floating sleeves and on the back panel, preventing the formation of peeling ensuring the suit should stay good looking for longer. Finishing off the impressive list of features are extraction handles integrated into the floating sleeve, ultra-thin quilting, lightweight welt pockets and an easy to locate puller on the collar and belt. Picture For Illustration Purposes Only. Our clearance stock is populated via an automated system so stock takes 24 hours to update. The item "Sparco X-Light RS-7 FIA Approved Nomex / Carmyth Race Suit Black Size 60" is in sale since Wednesday, September 27, 2017. This item is in the category "Vehicle Parts & Accessories\Clothing, Helmets & Protection\Car & Kart Racewear\Race Suits". The seller is "demontweeksoutlet" and is located in Wrexham. This item can be shipped worldwide.